If seeing the daily routine with new eyes is the inspiration for haiku, then surely travel is its antithesis. In a foreign setting, everything is new, and even when we hew to our personal routines, we are beset by unaccustomed images every moment. Hence the challenge of writing cogently to the theme of this contest: much of the reason we travel abroad is just for such new stimulation, and most of us will take months, not to say years, to process this newness into something like understanding, where it might become available for our haiku. It will come as no surprise, then, that the best of the poems on this topic seem not to dwell on the new sights, but rather the old routine that insists upon itself even in new surroundings. Another strategy is to imagine our new experience through the eyes of another to whom it is not new. However we arrive at it, travel haiku need some combination of old and new to come home to us. The very best of these do exactly that. The travel here is virtual: whether the poet makes an actual trip to his homeland is indeterminate, but s/he recognizes that the journey will be foreign. The fact that it is “their” language suggests the felt distance between heritage and present circumstance. And the fact that the intermediary is equally foreign — a machine that will do the “interpreting” — recognizes the true strangeness of the situation. Sounding out the way people speak their language is an important physical clue to the way people are, but that won’t even be attempted here. And so the contemporary traveler remains “other,” even if it were possible to go home again . . .
Those mountains never again seen are certainly the physical barriers that the poet crossed to arrive at his final abode on the Inland Sea, but they also possess a spiritual dimension. The fact that Santoka did not see them again testifies not to his unwillingness to rove, for which he never lost his taste, but to the total dissipation of his life brought on by advanced alcoholism that precluded further wandering. The fact that the saké shop is closed in this poem is perhaps fortuitous for the present poet, removing as it does the enticement to follow in the older poet’s footsteps too closely, thus perhaps providing the saving grace that permits this nostalgic recollection. Here we are made aware not only of the imaginary journey someone has made (we presume) through the reading of a book, but of an actual journey as proven by a torn ticket stub. The uncertainty of just where that actual travel might have been is a delicious detail. And since both actual and virtual travel here are vicarious to the poet, they provide a stimulation that is bounded in both dimensions only by his, and our, imaginations. A wonderful use of under-reporting for effect. 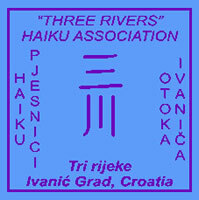 Congratulations to all poets and poetessess from Haiku Association „Three Rivers“, Ivanić-Grad, Croatia. The deadline is December 31, 2018.